Keeping your pond fish healthy and thriving depends greatly on providing them with a regular feeding schedule. While certainly not difficult, making sure you are providing the right amount of food at the right time every day can be a challenge. This becomes more acute if you leave for several days at a time. Providing your fish with an automatic feeder or slow-release food block will eliminate this issue entirely, supplying your pond fish with the food they need and taking one more chore off your busy plate. Pet Mountain's Pond Fish Feeder store features top quality products from the most trusted names in the pond and fish care industry, including Fish Mate and Tetra Pond. 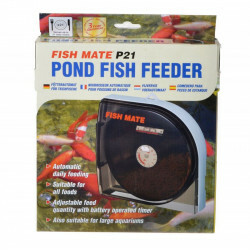 The Fish mate Pond Fish Feeder will make sure that your fish don't go hungry while you're away! This oversize feeder holds up to 6.5 lbs of pellet or stick food and comes with a programmable LCD panel to ensure your fish get fed when they need to. 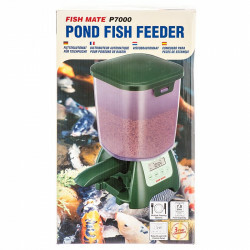 The Fish Mate P7000 fish feeders help ensure that your fish are fed regular, controlled portions to help maximize their health and vitality without worrying about over-feeding. 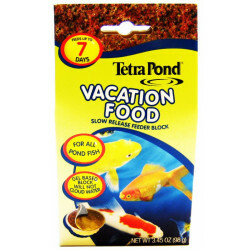 The Tetra Pond Vacation Food Slow Release Feeder Block will feed all pond fish for up to 7 days, without clouding your pond water. This gel based block will allow you to keep total peace of mind when traveling.